Kenan Moral Purpose Award Essay Contest Winners! What role does a liberal arts education play in creating a full life? 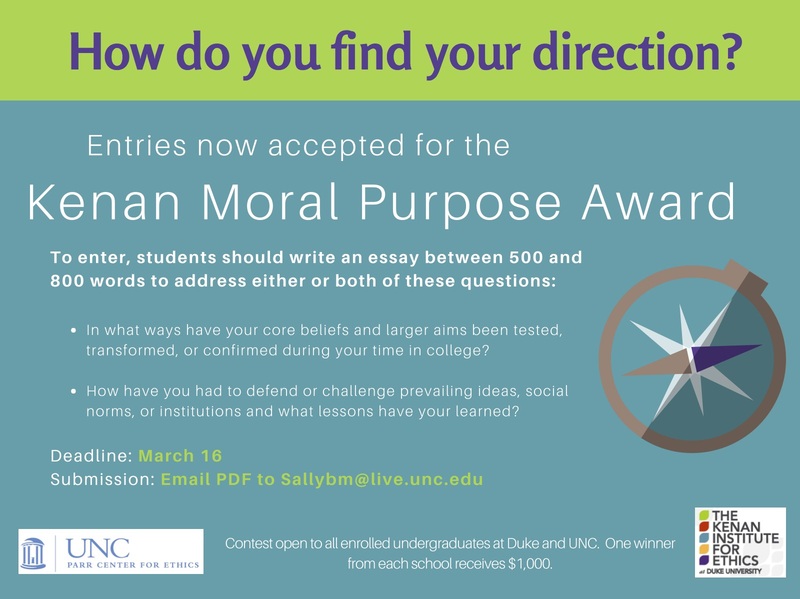 Duke senior Kimberly Perez and UNC-Chapel Hill senior Adesh Ranganna provide answers in their Kenan Moral Purpose Award-winning essays, given to the best student papers on the topic from the two schools. 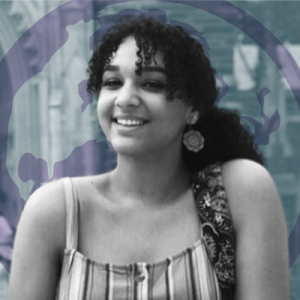 In her essay, “Knowledge is Power,” Perez reflected on how her coursework at Duke led her to both dig deeper into and reconsider questions of faith and religious belonging. 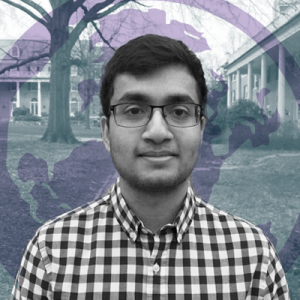 Ranganna used his essay, “What Ignorance Reveals,” to explore how studying Rawls’ philosophy of justice changed his perspective on what makes public health interventions just and fair. 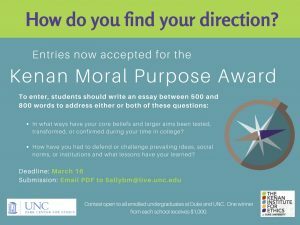 The annual Kenan Moral Purpose Award is given for the best undergraduate student essay on the role a liberal arts education plays in students’ exploration of the personal and social purposes by which to orient their future and the intellectual, emotional, and moral commitments that make for a full life. Established in honor of the Institute’s 15th anniversary at Duke and subsequently expanded, the award represents a partnership with the Parr Center for Ethics at the University of North Carolina at Chapel Hill, with one winner selected from each school. The winners of the 2018 Kenan Moral Purpose Award essay competition are Catherine Ward (Duke) and Keegan Barnes (UNC). Catherine (T’18) is a resident of New Bern and will graduate with an English major, an Education minor, and a certificate in Ethics & Society. Keegan (’19) is a Durham native double-majoring in Physics and Philosophy. Announcement written by Gautam Chebrolu, alum of the Kenan Institute for Ethics. Students can now apply for the Kenan Moral Purpose Award, an annual essay contest to highlight the role a liberal arts education plays in students’ exploration of their personal and social purposes. The contest, held in partnership between the Kenan Institute for Ethics and Parr Center for Ethics at University of North Carolina at Chapel Hill, is open to all currently enrolled undergraduate students at Duke and UNC. One winner is selected from each school to receive $1,000 based on entries that consider the intellectual, emotional, and moral commitments that make for a full life. In what ways have your core beliefs and larger aims been tested, transformed, or confirmed during your time in college? How have you had to defend or challenge prevailing ideas, social norms or institutions and what lessons have you learned from doing so? For additional information and past winners, visit the award website. Apply to our Undergraduate Fellowship Program! Are you an undergrad at UNC and interested in being more involved with the Parr Center? We have an impressive fellowship program and we’d love to have you! Please follow the link HERE to learn more and apply. APPLICATIONS DUE BY MONDAY SEPTEMBER 3RD AT 11:59PM. Please send any questions to our administrator, Sally Moore, at Sallybm@live.unc.edu. We are pleased to announce that our very own Keegan Barnes has won the Kenan Purpose Award Essay Contest for UNC with his essay “Plastic Pitchforks“. Congratulations, Keegan! A special thanks to those who submitted essays. Keep an eye out next year for this annual contest! Parr Center Faculty Fellow, Kim Strom-Gottfried, featured in the University Gazette! “Carolina is dedicated to fostering a campus community that upholds the highest standards of ethics and integrity. That commitment was affirmed in summer 2017 when Chancellor Carol L. Folt established the Office of Ethics Education and Policy Management and named Kim Strom-Gottfried to serve as the University’s director of ethics education and policy management. Strom-Gottfried remains the Smith P. Theimann Jr. Distinguished Professor of Ethics and Professional Practice in the School of Social Work. the challenges in upholding the highest standards of integrity and affirming the shared responsibility to do so. Now, she wants everyone to know more about the newly improved anonymous hotline they can use to meet that obligation. The Daily Tar Heel covers Ethics of Self-Care event! February 28, 2018, the Carolina Forum for Ethics (UNC’s first and only student-led organization dedicated to ethical exploration and discussion) held their first large event, The Ethics of Self-Care. This event was comprised of a panel discussion about when, how, and if we should prioritize individual needs over the needs of others. After the panel was a Self-Care Fair where organizations from around campus came to share their resources on self-care. Read The Daily Tar Heel coverage here! The Parr Center would like to extend a warm welcome to our newest graduate fellows listed below. These UNC graduate students are committed to incorporating ethics into their classes and personal research. Additionally, they frequently volunteer as speakers, panelists, judges, organizers, and much more to help extend the mission of the Parr Center. To learn more about this program and our newest fellows click here! It is our great pleasure to announce the acceptance of our three newest undergraduate fellows! Mitchell Brady, Guido Chiriboga, and Michael Quint will begin their work with the Parr Center January 10, 2018 and we could not be more excited! Additionally, four of our current undergraduate fellows will spend Spring 2018 away from the Parr Center. Their plans are listed below. We wish safe travels and all the best to these great fellows! Ying He – Internship in Washington D.C. This past October the Parr Center co-sponsored the Happiness and Well-Being Conference hosted by Philosophy, Politics and Economics. Please visit Happiness and Well-Being to view a video recap of the event, livestream videos from the individual talks, more information about the speakers, and their related work. New video: Watch some favorite moments from the NHSEB 2018 Nationals!